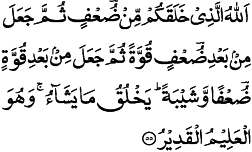 The Holy Quran rejects the notion that Jesus is still alive. Thirty verses in the Holy Quran directly or indirectly assert his natural death. Also, discussion of some troubling myths about him. All Quranic references count Bismillah as the first verse of a surah. It is hard to believe that any one would wish for Jesus to still be alive and cursed with over 2000 years of aging. A normal lifespan becomes painful after only 90 or so years, 2000 years of age would be an impossible existence. The Holy Quran terms aging an incontrovertible principle applicable on all life forms, including Jesus. Age eventually brings with it a loss of physical and mental powers. It is unstoppable and irreversible. If something is alive, it ages. Born in a state of weakness, man begins to gains strength until reaching a physical and mental peak, then decline sets in progressively diminishing one's faculties, until in advanced old age existence becomes a sort of living death with ones dignity entirely compromised. Mercifully, most people die before reaching this terminal stage. Jesus is a man, he may be a prophet but that does not make him exempt from this fact of life. Quran supports the contention that if he were still alive, his existence would be degraded to a state of mental death. Aging for 2000 years is perhaps the worst fate imaginable, and would not be suffered by a revered prophet of God. There is no precedent for what existence at that kind of age would be like, though we can imagine that such a person would be incapable of rational, coherent thought. His brain would be physically destroyed and muscles atrophied to complete uselessness. Rather than pin the hopes of the entire ummah's rescue on such a person, would it not be better to let him just die! dont forget some prophets has long age than our muhammads .Ibrahim has age more than 300 years old and noah has long age too when the Tsunami disaster comes through. No ones know really when and where (Jesus/Isa )will raise in the world..
Did Jesus raise the dead? Would Jesus descend on the shoulders of angels? Where did Jesus find his refuge?